Neu renovierte Penthouse-Wohnung mit massiven privaten Dachterrasse. Die Wohnung verfügt über Marmorböden und zeitgenössischen Möbeln. Brandneue Klimaanlage (kalt und warm). Mikrowelle, Fön, WLAN, 40 "HD-TV mit DVD-Player und Sat: Das Anwesen ist komplett ausgestattet mit. Es gibt eine Tiefgarage, einen Aufzug und Treppen zu der Wohnung. Die Anlagen sind wunderschön gepflegten und haben einen Swimmingpool mit geschlossenen Kinderbecken. Nur wenige Gehminuten von Finca Cortesin Golfplatz (Heimat der Volvo Masters) und 15 Minuten zu Fuß zu Casares Strand mit seinen Restaurants am Strand. Despite early hiccups concerning access and linen which were easily resolved our stay was almost perfect. Clean, well equipped, good location and wonderful views all combine to make Casares Penthouse ideal holiday accommodation. My wife and I being travellers of the third age (75 and 74) were very pleasantly surprised at how well presented this property is. It was virtually lacking nothing that would prevent us from enjoying our four week winter break. Our only minor but slightly irritating criticisms would be (i) Occasional barking from the dog next door. (ii) The stack of cushions stored In the lounge. (iii) The rattling of the dish aerial on the roof. From a personal point of view, the walk to the beach stretched us somewhat. In terms of straight line distance it was not too bad but to arrive at the main coast road and have to walk the extra distance to the pedestrian bridge and then have to do the same on our return followed by the uphill journey home deterred us from a second attempt. Having driven from the UK it was brilliant to be able to park the car in the garage and to take the lift to the front door of the apartment. Not only was it very convenient for unloading and loading our car but shopping was made so much easier and of course the car was kept cool and clean. 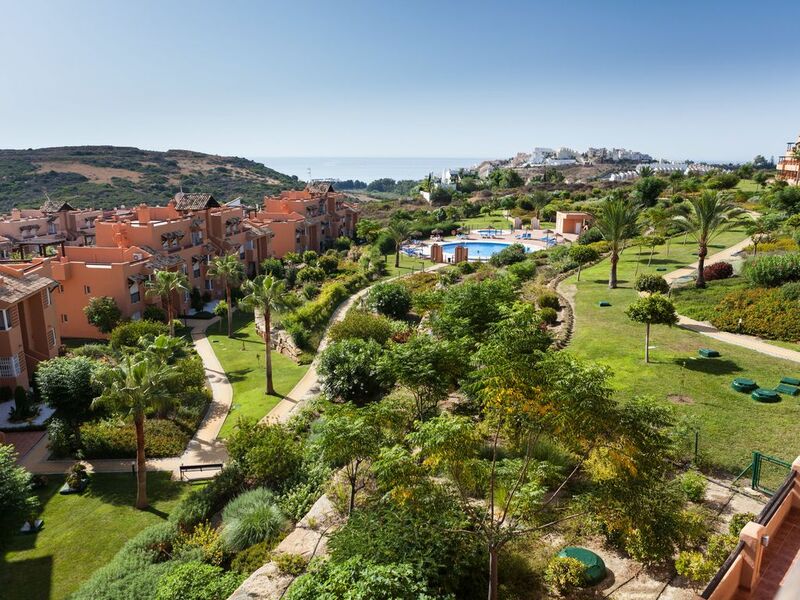 For us Casares Penthouse was very good, for a family with children it would be perfect as with what has already been mentioned there is also a good sized swimming pool very close by. In conclusion, we both agree that we would happily return to Casares but for the fact that we have never revisited any holiday destination in our many years of travelling. We greatly enjoyed our 4 days here - very comfortable and well appointed apartment with great views from the balcony and rooftop terrace. Close to the beach and within easy drives to Gibraltar, Estepona, etc. Excellent communication with the owner. Highly recommend. We stayed at the apartment 9-20 August 2018 as a family of 4 (2 boys aged 12 and 15). The apartment itself was very clean and decorated beautifully. It was a spacious base from which to explore this area of Spain. The top sun terrace was even better than we imagined and often catches a very welcome warm breeze. The complex is well-maintained and the pool area that we used was thoroughly cleaned every day. Having a lift made transporting suitcases and shopping bags simple, and the underground parking space meant that we didn't have to go through the usual holiday joy of standing around outside a hot car, waiting for the air-conditioning to kick in whenever we wanted to venture out. The kids were very happy about the wi-fi and satellite television (vital episodes of Match of the Day were not missed)! Everything that we needed from the kitchen was readily available. Antony was an absolute pleasure to deal with. Once we had made the booking, we received an emailed copy of a guide to the apartment which also included invaluable information about local shops, markets, restaurants and activities - as well as some further afield. This was a lovely touch as it meant we could start living the holiday early! Our deposit was returned in full and without delay. There was a minor hitch when it turned out the shower in the second bathroom was leaking into the apartment below, but this was dealt with quickly and efficiently. We were not expected to wait in for the plumbers, yet we were glad when they did catch us in as they provided great tips about a trip to Gibraltar we were planning! Overall, we could not fault the accommodation, area or the owner. We would not hesitate to recommend booking this apartment. Thank you for your review. We are so pleased that you enjoyed your stay, and we hope to welcome you back again someday. The property is amazing with everything you could need for a home away from home right down to a printer,paper and spare ink cartridges plus a WII-U for the kids to play. The underground allocated parking was great step out of your car 10m to the lift which takes you right up to the appartment,this place had it all plenty of towels,toileteries and loo roll,even dishwash tablets and washing liquid which was probabley left by previous guests but thankyou whoever! The second bathroom was a godsend especially with two teenage children. The beds were comfortable with fresh clean linen,the furniture in the lounge was modern, the balcony leading from it had enough room for four to breakfast or dine (could do with a parrasol though) and the roof terrace was amazing they have thought of everything, sun loungers with sidetables to rest your favourite tipple on, a dining table,BBQ and a rattan 5 piece garden set with linnen cushion covers, just the job. While at the appartment we experienced a heatwave and the airconditioning came into its own and coped really well in both the bedrooms and lounge. The gardens are immaculate and the swimming pools well maintained with plenty of sun loungers. Out and about, i would strongley recomend a visit to the village of Casares, truly stunning. Checkout the port, a large variety of restaurants and some more if you walk along the beach heading west that the locals use. Try a day out to Gibralter,amazing place, checkout everything loads of history,visit the top of the rock (watch out for the touts at the bottom with the minibus deals?) Duty free shopping, cheap fuel Great! The walk to the local beach takes 15 minutes but allow a good 25 on a hot day coming back or grab a cab from the taxi rank near the roundabout. This place ticked all our boxes and if family comitments didnt dictate our next few holidays we would return next year however if Antony and Sandra still have it we will definatley consider a return and i would strongley recomend this place to all that are looking for a value for money break. Lovely Apartment, especially the roof top area which has sun loungers, BBQ, sofas to chill, relax or entertain. Close to a couple of well maintained pools and a golf club nearby by that has a restaurant and a roof top cocktail bar, other amenities seem to be a little further out by car or long walk. Overall, a well equipped self catering apartment, modern & clean, thoroughly enjoyed our stay.